Since the early seventies, the nuclear industry and the environmental movement have been arch enemies. According to the industry, nuclear power would provide abundant electrical energy, “too cheap to meter”. And according to the environmental movement, nuclear power would burden the present generation with the risk of terrible accidents and proliferation, and future generations with deadly waste. After the Chernobyl disaster in 1986, it seemed that the green movement had, in a cynical way, “won” the argument; the nuclear industry’s progress came to a halt. 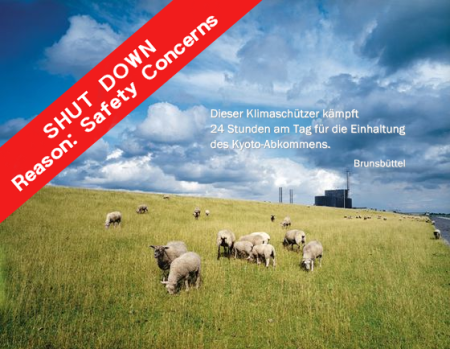 Manipulated image from klimaschuetzer.de-website of the currently shut down German nuclear power plant Brunsbüttel. German text: This climate protector is fighting 24 hours per day to meet the Kyoto targets. However, today, with the emergence of climate change on the political agenda, and the search for alternatives to traditional fossil fuels, an increasing number of voices are demanding more nukes for the sake of fighting climate change. This time, the green movement seems to be getting cornered. It is interesting to note that the same green movement which was always campaigning against nuclear power worked long and hard to get climate change on the agenda. Therefore, there is a strong resentment against the green movement within the nuclear industry. But, suddenly, due to a change of fate, a topic on which the green movement is also campaigning became the selling point for nuclear power. So today we can observe this amazing situation, where the nuclear power industry is teaming up with climate campaigners to proclaim the importance of climate change, and of course their nice radioactive solution for it. See for example the nuclear website http://www.klimaschuetzer.de (“Climate protectors”) [ref]. So this is the present state. 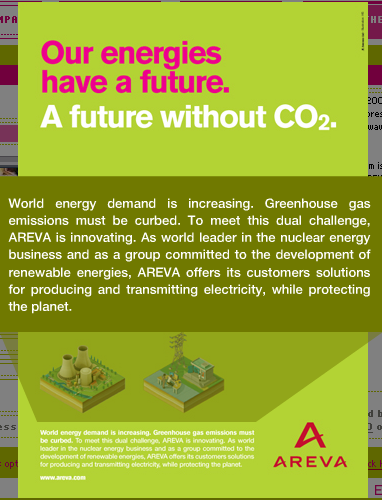 All the large companies of the nuclear industry have their PR departments well tuned to spread the message of “protecting the planet” (Areva) or to “preserve our environment” (Westinghouse). However, when you listen closely to the protagonists of nuclear power, you can find that many of them are still allergic to promoting an issue which actually belongs in the portfolio of their opponents. Nuclear energy has always been supported by energy intensive industries, by weapons designers and by power hungry politicians. These protagonists don’t really feel at home with the green agenda. There is reason to believe that several of them are actually still quite climate sceptic. We all know that the current president of the United States, George Bush, is not very convinced about climate change; he single handedly tried to strangle the Kyoto Protocol. Also, the Czech president Vaclav Klaus equals environmentalism with “Soviet communism”. At the same time, Klaus explains that the Czech Republic needs nuclear energy, and Bush is quoted saying “It is time for this country to start building nuclear power plants again”. Recently, FORATOM, the Forum for Nuclear energy in Europe, collected signatures amongst European Members of Parliament to support their “declaration”. Amongst the 50+ signatories are a number of climate sceptics. For example; Struan Stevenson and Roger Helmer the most outspoken climate sceptics in the European Parliament. It will probably take a while before these sceptics are persuaded to toe the line of the nuclear industry’s spin doctors as well. See also Dutch a statement by Dutch climatesceptics, co-signed by Rob Kouffeld, of the Dutch nuclear lobby "Kernvisie". Struan Stevenson - Is global warming really happening? Doubling by 2030 the installed nuclear power to generate electricity is not only impossible but would have no influence on CO2 emissions and greenhouse gas (GHG). The nuclear electricity accounts for only 2.1% of global primary energy and 3.0% of final energy consumption in the world. Increase of 40% (IEA), or 87% (IAEA) the power of nuclear energy, equivalent to 149 or 321 reactors of 1,000 MWe capacity, would have little impact on CO2 emissions and even less on those of all greenhouse gases. If all this power was used to replace coal-fired power plants, the quantity of CO2 avoided would be 1,008 or 2,172 Mt Mt CO2 as appropriate, or 3.7% or 8.0% of CO2 emitted by fossil fuels and they only (27,055 Mt CO2 in 2005). This proportion is 2.1% and 4.5% for all greenhouse gas (equivalent to 47,800 Mt CO2 in 2005) since carbon dioxide (CO2, carbon dioxide) is not the only one of these gas. Meanwhile, if one follows the estimates of the International Energy Agency, the quantity of CO2 emitted by fossil fuels would increase to 40,000 Mt CO2 or only 34,000 Mt in an alternative estimate, representing an increase of 47% or 25% of CO2 emitted by fossil fuels. But more important to note is unable to increase in such proportions power of nuclear energy in the world. Combien de réacteurs nucléaires en 2030 ? Doubler d'ici 2030 la puissance nucléaire installée pour produire de l'électricité est non seulement impossible mais n'aurait pas d'influence sur les émissions de CO2 et de gaz à effet de serre (GES). L'électricité nucléaire représente seulement 2,1% de l'énergie primaire mondiale et 3,0% de l'énergie finale consommée dans le monde. Augmenter de 40% (AIE) ou de 87% (AIEA) la puissance de l'énergie nucléaire, soit l'équivalent de 149 ou 321 réacteurs moyens de 1.000 MWe, aurait peu d'influence sur les émissions de CO2 et encore moins sur celles de l'ensemble des gaz à effet de serre. Si toute cette puissance servait à remplacer des centrales électriques à charbon, la quantité de CO2 évitée serait de 1.008 Mt ou 2.172 Mt de CO2 selon le cas, soit 3,7% ou 8,0% du CO2 émis par les combustibles fossiles et eux seuls (27.055 Mt CO2 en 2005). Cette proportion serait de 2,1% ou 4,5% pour la totalité des gaz à effet de serre (équivalent à 47.800 Mt CO2 en 2005) puisque le gaz carbonique (CO2, dioxyde de carbone) n'est pas le seul de ces gaz. Pendant ce temps, si l'on suit les estimations de l'Agence internationale de l'énergie, la quantité de CO2 émise par les combustibles fossiles passerait à 40.000 Mt CO2 ou seulement 34.000 Mt dans une estimation alternative, soit une augmentation de 47% ou de 25% du CO2 émis par les combustibles fossiles. Mais le plus important à noter est l'impossibilité d'augmenter dans de telles proportions la puissance de l'énergie nucléaire dans le monde. See DodgyGeezer's comments on Becks article on risk. I have been campaigning for a government driven campaign to make the UK a Near-Zero Carbon Country since shortly after I invented the Buxton Geothermal Turbine Generator in the 1980s. Twenty years down the line the UK has done nothing, and I get the run around from various government departments. I am sure that these same people will give me the run around for another ten years, when it will be too late to stop global warming. It is difficult to get hold of all the figures necessary to show that countries can become near-zero carbon countries. However, there is a simple explanation that adequately reveals how this necessary target can be achieved. All our power requirements are for lighting, heating, transport, and energy for such things as industry on down to exercise machines. To make things simple we can assume that each category is 25% of total power. The lighting can be zero rated by building Buxton Geothermal Turbine Generators, the heating can be near-zero rated by installing Starlite coatings, that prevents heat escaping, on the walls and ceilings of all premises, and by having electrical heating from renewable sources we cut heating CO2 emissions to zero. Transport can be made near-zero in terms of carbon emissions by ensuring that all vehicles use carbon zero electricity, instead of petrol. This may seem to be an anathema to ‘‘petrol heads’’ but this displeasure can be simply overcome. At the moment when inventors come up with new technologies for electrical vehicles Oil Companies buy and destroy the patents and designs. These patents have a shelf life of ten years so we could soon put together a group of past inventors in this field to reproduce their work legally, as an intergovernmental team. We still have the problem of transport by aeroplane and ship having to use fossil fuels. However, their carbon footprints can be at least halved by having their fuels mixed with water using an ultrasonic dibber. Finally, the power needed for energy can be made entirely of carbon free electricity. New ways of making industry work using electricity instead of the gas that they are used to will be needed, but these are not insurmountable problems given that the Governments of the world have ten years to achieve the target. All Government Departments must be part of the solution to the greatest threat to life on earth. They must work together, there is no point in hoping that the ‘invisible hand’ of the market has the ability to pay for such a massive clean up. In comparison, the threat of terrorism is a minor side show, and we would not leave the market to this task. The £60 billion being spent on replacing Trident submarines would have solved CO2 emission problems in the UK. This does not mean to say that this was our last chance, just a step in the wrong direction. Funding can be found from elsewhere. ‘The Ecologist’ magazine estimates the true cost of mental illness to the UK is £100 billion per year. When all patients suffering from mental illness are passed on to their trained local practice nurse for a thirty second cure using the Kadir-Buxton Method then we have immediate and massive savings. (The alternative of expensive drugs which, in trials, have less success than no treatment at all, should be made a thing of the past). The money saved by the UK would clean up CO2 emissions in the UK using the above plan. It is also easy to adapt it to any other country. you suggest: "So far nothing better is invented". I disagree. Take a look at the fast growing proven technology of concentrating solar power (CSP), also being described as Solar Thermal. Utility scale electricity generation from a totally clean source which will only run out when the sun dies. Several millions of years after humankind dies out! Einstein said: "Any fool can make things bigger, more complex, and more violent. It takes a touch of genius - and a lot of courage - to move in the opposite direction." Apart from stored geothermal heat, the Earth gets all its energy from the Sun, and this will be the case for ever - so let's start using it intelligently and not waste time with short-term chemistry experiments like nuclear power and biofuels. The best place for a nuclear reactor is 93 million miles away. Well, I had a chance to speak to some proponents recently (Russian nuclear experts forum www.atominfo.ru) - even asking them a few tricky question, for instance, regarding the concequences of nuclear waste accumulating without any permanent facilities to sore them, also regarding uranium enrichment technologies which emit greenhouse gases as well, - and the answer was: YES there are risks but so far nuclear power is the most cost-efficient and environment friendly technology existing in commercial operation that can meet the growing energy needs. So far nothing better is invented. Therefore, nuclear renessaince is about to become a reality in nearest future. That reminds what Churchill said about democracy - its bad but so far the humanity did not invent any better.